We use our blog as a medium to provide useful information to the electronics engineering community. Most of our blog articles can be of interest for a long time after they are published, and we frequently got feedback from readers that they are not so easy to find back. A simple list of all articles, similar to a table of contents in a book can help to give you an idea what kind of information is available in our blog-posts. The following table shows the title of the blog, the publishing date, and the number of hits, to give you an idea of the popularity of the item. Most people here in Belgium say you need to wait till December 6, because that is the feast day of Saint Nicholas “Santa Claus”. In every family it is different. Therefore, no specific day or schedule is set for when to decorate your tree. Some people will choose to go with family tradition, others choose a random day where they have everyone together, while others decorate the tree on Christmas Eve. 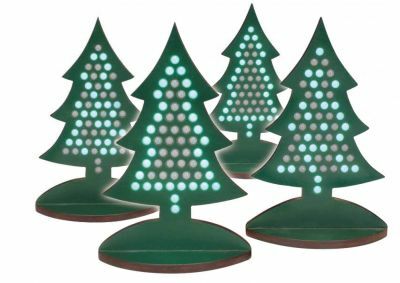 This year you can start putting up your Christmas tree from December 7, as we start shipping the “Elektor” Christmas tree on St. Nicholas day. Make sure you order your tree well in advance as we will produce 100 trees only. 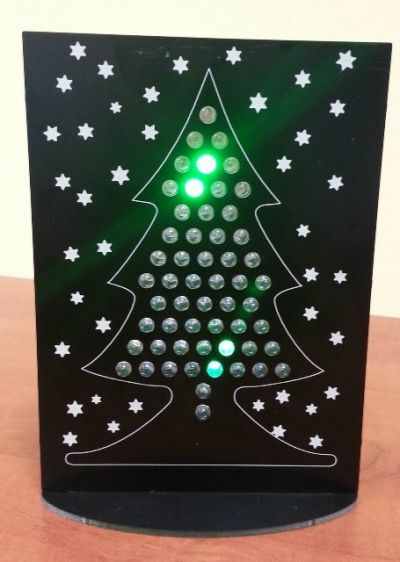 https://www.eurocircuits.com/wp-content/uploads/blog/When-should-you-put-up-your-Christmas-tree/thumb_tree.jpg 283 400 Luc Smets http://www.eurocircuits.com/wp-content/uploads/2016/07/eurocircuits.png Luc Smets2012-11-29 00:00:002018-05-14 16:03:32When should you put up your Christmas tree? 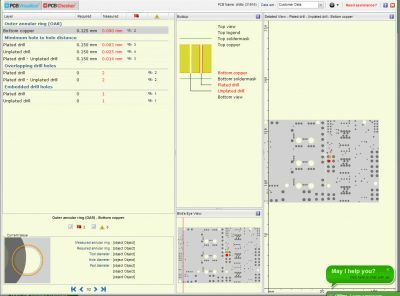 PCB Visualizer gives you complete control over the critical transfer of data from designer to fabricator. You leave nothing to chance. A brief on-screen check gives you 100% confidence that the board we are going to make is the board that you want – confidence and peace of mind so that you can concentrate on the next design without worrying about the last one. 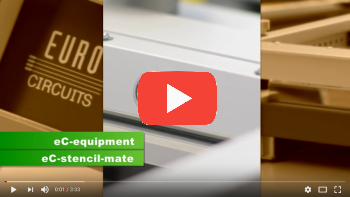 Customers from right across the electronics industry tell us that PCB Visualizer and PCB Checker are already powerful tools to verify PCB data before placing an order. But there are always more features and more functionality they would like to make the software even more effective. So we have a dedicated team of software and electronics engineers who are constantly improving the tools and adding valuable features. 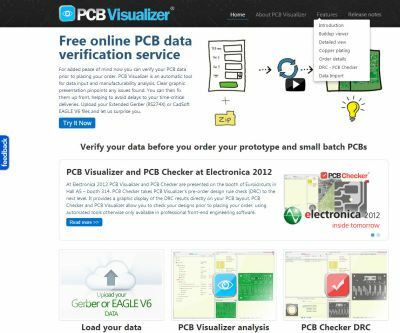 To keep you up to date with all the new functionality in PCB Visualizer we have now created a dedicated project website which has all the latest information as well as hints and tips on how to get the best out of the software. 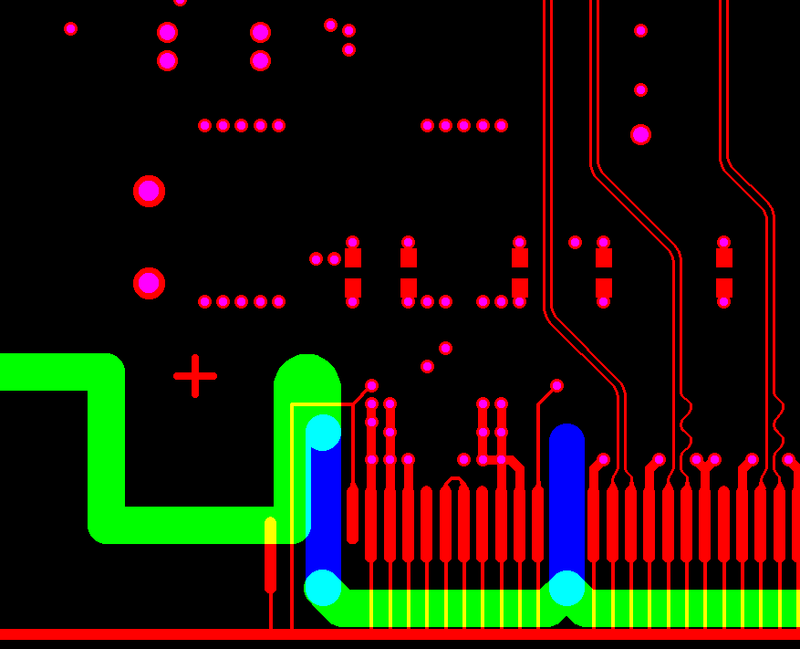 Today we release an update for our PCB Visualizer and PCB Checker automatic analysis tools. We have also doubled the processing capacity of our analysis software tool so that we can process more jobs in less time. Due to the rapid increase in the number of jobs we need to process in PCB Visualizer, the waiting times got too long to be comfortable. We added a vertical and horizontal ruler to the detailed view window. When you zoom in and drag a part of the layout to one of these rulers, you can measure distances and sizes. 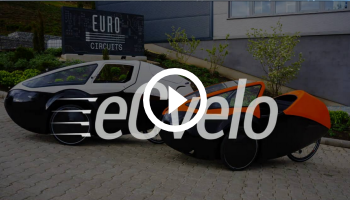 Twelve years after the start of Eurocircuits in 2000, we received order number 500000. That”s a lot of orders we have processed online. Order number E500000 was placed by Page Electronics in Ieper, Belgium. 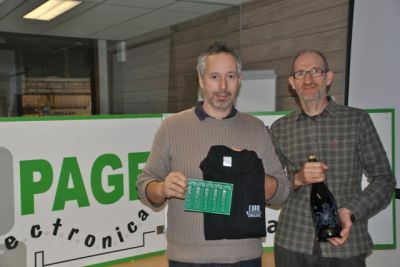 Luc Page is one of our most loyal customers, working with Eurocircuits, and before that Europrint, ever since we started in 1991. 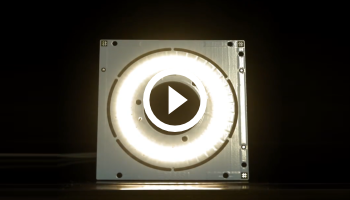 Luc can expect us Monday next week – this order we are going to deliver personally, and there will be more than just printed circuit boards in the box. …. and the boards are delivered on Monday as expected, together with some bottles of Gouden Carolus, a famous beer from our local brewery in Mechelen ” Het Anker”. – Cheers Luc and Johan. 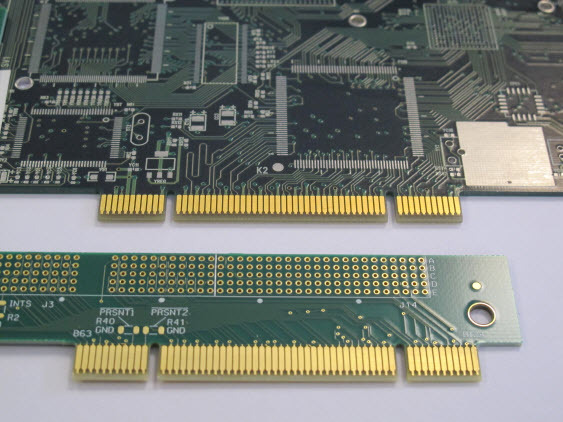 Eurocircuits offer two types of gold finish: Electroless Nickel Immersion Gold (ENIG) as a surface finish for the whole PCB, and hard plated gold over plated nickel for edge-connector fingers. Electroless gold gives excellent solderability, but the chemical deposition process means that it is too soft and too thin to withstand repeated abrasion. Electroplated gold is thicker and harder making it ideal for edge-connector contacts for PCBs which will be repeatedly plugged in and removed. We plate the hard gold onto the PCBs after the soldermask process and before we apply the surface finish to the rest of the board. Hard-gold plating is compatible with all the other surface finishes we offer. We first plate 3 – 6 microns of nickel onto the edge connector fingers and then on top of that 1 – 2 microns of hard gold. The plated gold is not 100% pure; it contains some cobalt to increase the wear-resistance of the surface. 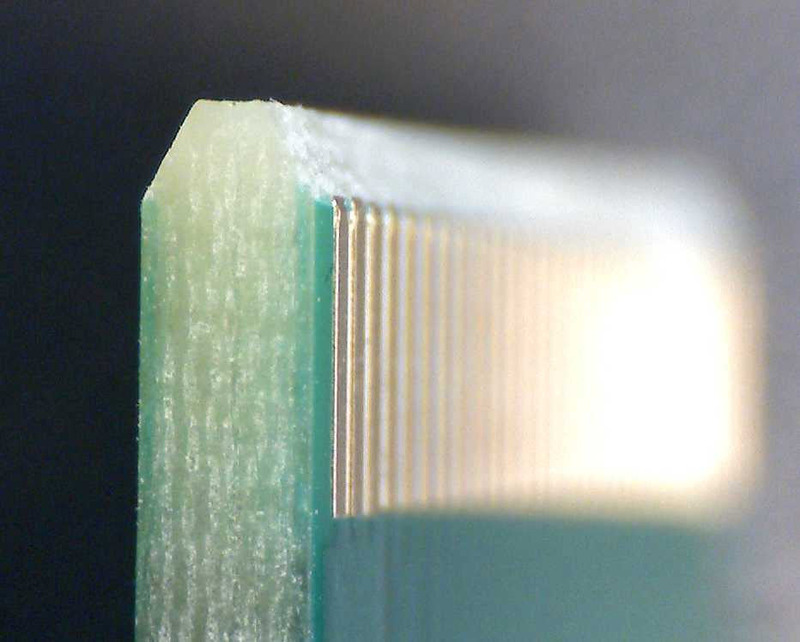 We normally bevel the edge connectors to ensure easy insertion. Bevelling can be specified in the order details. To make sure that the gold fingers align exactly with the edge-connector profile, we rout the vertical edges of the connector on the first drill run. The edges of the connector are then exactly aligned to the printed image. In some cases one or more gold fingers are shorter than the rest, so that the longer pads connect first when the PCB inserted into the connector. This means that the shorter pads cannot be connected vertically to the plating bar. They have to make the connection needed for electroplating in another direction (see illustration. Here the blue lines represent the profile added at first drill stage and the green the final profiling). After plating we check the adhesion of the plated nickel and gold with an industry-standard tape-test. We measure the thickness of the plated layers with a non-destructive X-ray measuring machine. The plated pads have to be on the edge of the PCB, as this is an electroplating process. There has to be an electrical connection between the plated pads and the production panel frame. The maximum length of the plated pads is 40 mm as we use a standard shallow plating bath . 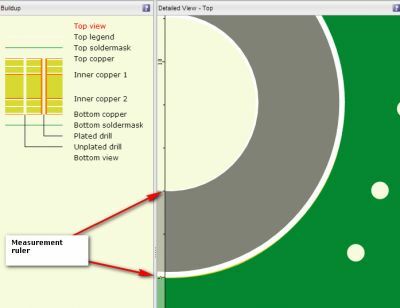 Inner layers have to be free of copper at the edge of PCB. Otherwise the bevelling could expose the copper. If you want your PCBs delivered in a customer panel, the panel frame/border must be open on the edge connector side to allow us to make the connection for electroplating. We can plate hard gold on two sides of PCB. But if the connectors are on the opposite sides of the PCB there has to be a minimum 150 mm between them. 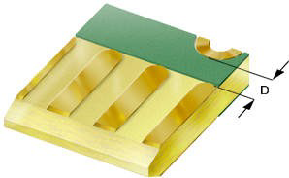 To ensure optimum quality surface-finish, do not place any plated holes (PTH), SMD or other pads closer than 2.00 mm (80 mil) to the gold fingers – see drawing.